Pregnant And Considering Home Birth? What You Should Know : Shots - Health News A tiny fraction of American women choose home birth, but that number is inching up. And in some social circles it's downright trendy. One pregnant woman investigates the pros and cons. Home Birth Can Be Appealing, But How Safe Is It? Lesley McClurg sits on the floor of her home in Oakland, Calif., reading a birthing book. McClurg has been taking the time to decide between having a home birth or a hospital birth. As my belly grows, I'm more and more stressed by a decision that's weighed on me for the past eight months. Where should I deliver my baby? Last summer, when I found out I was pregnant with my first baby, I initially envisioned, like most American women, a hospital delivery. In fact, that's where roughly 99 percent of U.S. children are born. That's not a surprise: The American College of Obstetricians and Gynecologists, or ACOG, recommends hospitals or accredited birth centers as the safest option for having a baby. Home birth numbers have been rising recently, but today still only about one percent of babies are born at home each year. Yet to judge by my particular social group in the San Francisco Bay Area, you'd think home birth was by far the norm. Last year, six of my friends gave birth in their living rooms. Afterward they shared powerful photos from the experience, of birthing tubs surrounded by candles. And they warned me that physicians and nurses in a hospital might push me to have medical treatments I might not want, such as drugs to speed my labor, an unnecessary C-section or pain meds. Home birth sounded appealing because I could direct the shots rather than being at the whim of doctors or nurses. Plus, cozying up in my own bed with my husband and baby after hours of exhausting contractions sounded ideal. Finding a home birth midwife in California is fairly easy because the state allows certified midwives to practice even if they are not already nurses. This is not the case in some other states that don't allow midwives or limit the number of legal practitioners available. When I shared the possibility of a home birth with my mother, she basically freaked. "You could have a complication or something happen where you would need to be in a hospital," my mom said. "If there's a problem, I want you to be where you need to be." Just to make sure she landed her point, she told me about my older brother's birth. "He came out blue," she said, shuddering. "They whisked him away to the intensive care unit. And I was afraid that he'd gone a long time without breathing, to the point where he might be brain damaged." Fortunately, my brother was fine, and my mom credits the hospital for saving his life. Nationwide, planned home births have roughly twice the rate of infant death as hospital births. Babies in planned home births are more likely to have seizures or neurological problems, although these are still very rare. Of first-time moms choosing home birth, up to 37 percent transfer to a hospital, largely because the baby is unable to move through the birth canal. Planned home births end up with fewer cesarean deliveries (53 births per 1000 compared to 247 per 1000 hospital births). I decided to consult a woman who specializes in high-risk pregnancies. 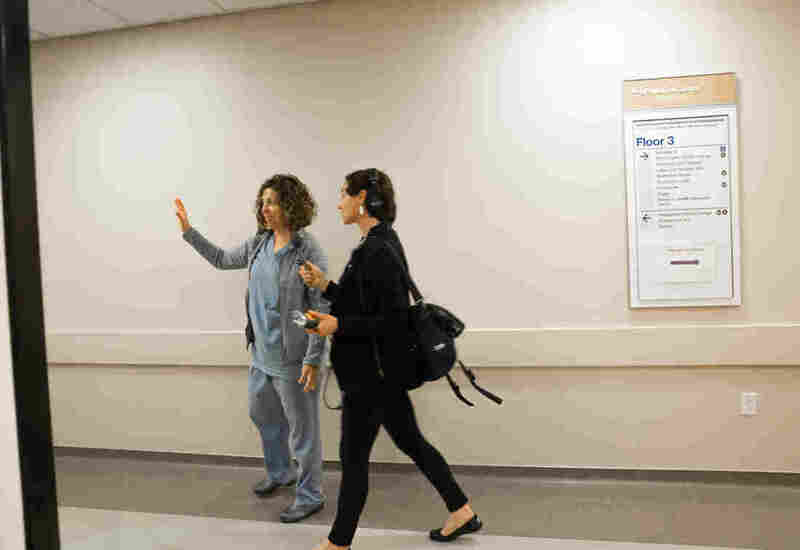 Dr. Neda Ghaffari, a perinatologist at the University of California, San Francisco, says delivering in the hospital is generally safer than being at home, because a team of practitioners is always available in case of emergency, which any woman can experience during labor. A mother may begin hemorrhaging, for instance, or the baby may become blocked in the birth canal. "It's very hard to determine which patients are going to have an obstetric emergency," Ghaffari says. Plus, Ghaffari notes that, according to ACOG, babies die in home births at roughly twice the rate as they do in hospital births. Plus, one (admittedly very rare) complication, neonatal seizure, is three times more common at home. If a woman with a low-risk pregnancy does choose a home birth, Ghaffari recommends the same precautions as ACOG. She should live within 15 minutes of a hospital, for example. And she should avoid home birth if the baby is breech, if she is pregnant with multiples or has had a cesarean in the past. I'll admit the conversation with Ghaffari stoked my fears about home birth. For a home birth perspective, I talked to Maria Iorillo, a state-licensed midwife in San Francisco. She's attended births for three decades and says she's tallied 1,400 births, most of which unfolded safely at home. KQED's Lesley McClurg tours labor and delivery at UCSF Benioff Children's Hospital with Vanessa Tilp, a certified nurse-midwife. "Birth is not a medical procedure," Iorillo says. "It is a process of you becoming a mother — of this little person meeting you on the outside for the first time, and continuing that relationship." If a mom chooses to take that journey at home instead of the hospital, she will feel the full brunt of the experience, because no pharmaceutical pain relief will be available. Though Iorillo does carry medical items such as an oxygen tank, numbing agents, suturing materials, acupuncture needles and herbs. "I have three big bags of stuff," she said. "And my hope is that when I come to your birth, I won't have to use any of it." Iorillo says her clients desire a birth with the least amount of medical intervention possible. She describes the appeal of home birth by comparing it to running a marathon, in the sense that they're both arduous, excruciating and rewarding. "You can really kind of tap into what's a woman's body's made for," Iorillo said. Plus, she stresses the likelihood of a cesarean section is much higher if a woman begins labor in the hospital. Currently about 30 percent of hospital deliveries are done by a C-section in the U.S. (though rates vary by hospital). That rate is much higher than the World Health Organization's recommended 10 to 15 percent. C-sections carry additional risks such as increased blood loss, pain and infections. Plus, a woman who undergoes a C-section is much more likely to require the same in future deliveries. One thing I learned from my research is that I'm a good candidate for home birth. I don't have diabetes, high blood pressure or other conditions that could complicate delivery. I only have one baby inside my belly, and I live close to a hospital. So I found myself rethinking home birth. I needed to talk to someone who knew both worlds. Dr. Robyn Lamar is an OB-GYN at UCSF. Despite her profession, she chose home births for all three of her children. She says she prefers to labor at her own pace in a familiar setting, without medical intervention. "The underlying belief in midwifery is that birth is a physiological process, which makes sense to me," Lamar says. "Versus the more medical view, which I'm trained in and I practice, that birth is something that can be high-risk at any moment and it's sort of a disaster waiting to happen." Lamar emphasizes that, at the hospital, a mother is at a higher risk for an episiotomy (vaginal incision) and infection. Lamar recognizes that what's best for one woman may not be right for the next. "Some [women] feel more at ease in the hospital because they know the experts are there. It gives them a lot of security and assurance," Lamar said. "But, a lot of us feel like a duck out of water in the hospital. It's very unfamiliar. When you're on your home turf, and you're there with your family, it really does change the dynamic." She says a mother is more likely to dilate and embrace difficult contractions if she feels comfortable and supported in her surroundings. In other words, feeling safe can not only lead to a more positive emotional experience, but also a faster delivery. When I asked Lamar directly to advise me on my own decision, she answered very neutrally, with a smile. "Oh, there's no right answer," she told me. "I think it's such an individual journey for everybody. Whether you give birth in a hospital, or at home, or in a birth center, everyone's story is going to be completely unique." Another factor to consider is cost, which varies widely depending on the type of insurance you may or may not have. If I choose a home birth I'll pay completely out of pocket. In the Bay Area, midwives' fees are $4,000 to $8,000. If I choose a hospital, my insurance will pay all the bills. For someone without insurance, the price of a home birth wouldn't change, but a trip to the hospital could potentially put me back tens of thousands of dollars. "In terms of reproductive justice, it makes sense for all women to have the same array of options around birth like you would in a country like England, where there's national insurance," she said. "One should be able to choose their place of birth based on preferences and risk level rather than financial means." She hopes insurance companies will consider the benefits of home-birth and future plans will cover the costs. I tried to prevent money from influencing my decision by continuing to talk to friends and experts, reading studies and touring hospitals. After nine months of searching, I'm starting to heavily lean in one direction — though my feelings still change almost by the day. Either way, this baby is coming ... and soon!